Each investor defines wealth. It's entirely subjective. When investors and developers, institutional or entrepreneurial, reach their wealth level, their risk tolerance diminishes. We and our affiliates help investors and developers reach their wealth level by originating real estate investment packages and uncovering development opportunities. -- Arthur Bruzzone, M.A., M.B.A.
Strategy is set at acquisition. To this end, we target off-market and pre-market properties, including entitled, value added, and near-completed projects. Infuse value, through project build out or, for in-place properties tactically correlating property management decisions to value enhancement measured by performance accounting. Disposition of the investment. That is, repositioning to the next investment or project. We execute acquisitions and exchanges, enabled by our seasoned network of owners, developers, investor groups and affliates. We also package real estate investments and developments with infused capital, technical support, and our affiliated legal professionals. We provide asset management services, using propietary performance monitoring metrics to correlate property management decisions to value enhancement. Arthur Bruzzone is a California real estate professional and investor, and a media commentator and journalist on business and political issues. He is a retired California State Commissioner who served on the regulatory state agency, the Bay Conservation and Development Commission (BCDC). He also served as Co-Chair of the Port of San Francisco/BCDC Joint Committee on the San Francisco’s Waterfront Plan, and as a member of the, San Francisco Air Quality Board Resource Team. He is a former Member Board of Directors of the San Francisco Planning and Urban Research (SPUR). He has over 25 years of transactional experience including capital formation, joint ventures, and performance asset management exceeding $75 million in value. His experience as an investor has enhancd his services for partners and clients. He has four years of construction management experience at Bechtel Corporation, working on projects in Saudi Arabia, Algeria, Canada, and Indonesia. Mr. Bruzzone has made over 125 guest media appearances. He is a Bay Area business and political broadcast journalist and has written over 200 articles for national and regional media including the Wall Street Journal. He has been a regular contributor to the San Francisco Business Times, the San Francisco Real Estate Journal, writing on the economy, urban issues, planning projects, and political issues. He hosted and produced the award-winning TV series, "San Francisco Business Watch". Arthur Bruzzone earned a Masters Degree in Real Estate and Business Management from Golden Gate University, San Francisco, California, and is a licensed California State real estate broker. He is a Returned Peace Corps volunteer, having served in the Kingdom of Tonga. 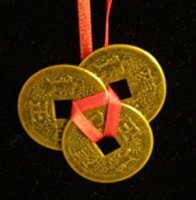 Chinese coins are a symbol of wealth, prosperity, and good fortune.